M-NCPPC is hosting a meeting tomorrow night on the Central Avenue Connector Trail Project. This is a great project, perhaps the most important bike project in PG County and so anyone who thinks they might bike in the area (to FedEx Field for example) should consider attending. Join staff for a second communitywide meeting, Tuesday, June 16, 2015, 6:30 p.m. at St. Margaret’s Church, 410 Addison Road South, Capitol Heights, MD 20743. The Central Avenue Connector Trail will begin just west of the Capitol Heights Metrorail Station, running through a combination of Washington Metropolitan Area Transit Authority right-of-way, neighborhood streets, and existing and planned trail segments before ending at the Largo Town Center Metrorail Station, with connections to the Addison Road-Seat Pleasant and Morgan Boulevard Metrorail Stations along the route. The east-west trail will provide alternate travel routes for pedestrians and bicyclists, enhance access to alternative modes of transportation, and support safety and mobility along the corridor. It will also help to revitalize the surrounding communities by providing infrastructure to support transit-oriented development (TOD). The TOD Implementation Study also notes that similar trail networks have been shown to substantially increase walking and bicycling trips as well as property values. On the west side it could tie in to the Marvin Gaye Park Trail and to a completed WB&A Trail. How I wish that they had included a bike path on the Metro bridge over the Beltway that was built when the Blue line was extended east. It would have been useful from day 1, but even more so with this project. The cover story of the latest issue of the City Paper is on Marvin Gaye Park, which features the Marvin Gaye Park Trail (formerly the Watts Branch Trail). If you've never ridden it, I recommend it. It's very nice. I never realized how old it was. In the early 1970s, control of the park was transferred from the National Park Service to D.C., and in 1977, the city received $500,000 in federal funds for Watts Branch improvements. A bike trail was constructed based on a community-developed plan the following year. [n 1997, a national foundation asked Friends of Meridan Hill] asked the neighborhood kids what they wanted to see—a bike trail, an amphitheater, a safe, clean place to play—and they turned the wish list into a call to action. The call helped Washington Parks & People get a grant to launch its Down by the Riverside Campaign in 2001, and the revitalization began. The park as it exists today begins at Minnesota and Nannie Helen Burroughs avenues in a grassy area with benches called Lady Bird Johnson Meadows. There, a six-foot circular, mosaic portrait of Marvin Gaye begins the dedicated trail. It runs east along the stream through quiet neighborhoods and past the D.C. government’s Lederer Youth Garden before connecting with the sidewalk on Nannie Helen Burroughs. The trail picks up again near the school founded by the avenue’s namesake and continues to the Watts Branch Playground and Marvin Gaye Recreation Center on the Maryland line. The heart of Marvin Gaye Park, off the 600 block of Division Avenue NE, is surrounded by single family homes, vacant buildings, a Chinese carryout, and liquor and corner stores. That section of the trail curves around H.D. Woodson, the D.C. public high school that underwent a $102 million renovation a few years ago. Though not a rail trail, the trail runs in the same ROW as the old WB&A rail line for several blocks and not far from the old Chesapeake Beach rail line. You can even see an old abutment for the WB&A just off the trail west of Division Avenue. It would be nice to see the trail expanded into Maryland. District of Columbia Department of General Services has issued an RFP for a new Marvin Gaye Recreation Center. The Project includes demolition of the existing one story structure and the construction of a new structure of approximately 15,000 GSF to serve as the recreation center as well as site improvements and revitalization of the Marvin Gaye Trail to be completed in the summer of 2016. I don't know anything more than that. But if you've never riddent the MGT, you're missing out. It's a very nice ride even if, like so many things, it dead ends at Maryland. DDOT has announced a public meeting about improving Benning Road and Benning Road Bridge. The Federal Highway Administration (FHWA) and The District Department of Transportation (DDOT) are preparing an Environmental Assessment (EA) for the proposed Benning Road and Bridge Multi-Modal Transportation Improvements, per the requirements of the National Environmental Policy Act (NEPA). The project will also include evaluation of historic resources, as required under Section 106 of the National Historic Preservation Act [PDF]. The study area is along Benning Road, NE, from Oklahoma Avenue to the Minnesota Avenue and Benning Road Metrorail Stations. This public meeting will serve to inform attendees about the project’s scope and discuss transportation issues. This is probably more streetcar-oriented, but it's an opportunity for cyclists. The Anacostia Riverwalk Trail connects to Benning Road at 3 places along this stretch. The bridge is the only place to legally cross DC-295/Anacostia Freeway by bike or on foot from Hayes St to Pennsylvania Ave (and Hayes is impossible to get to from Benning Road) making it a critical connection. Unfortunately the quality of that connection does not match its importance. This is an opportunity to create better connectivity on both sides of the Anacostia, between the ART and the Marvin Gaye Park Trail and between River Terrace to the Minnesota Avenue Metro. 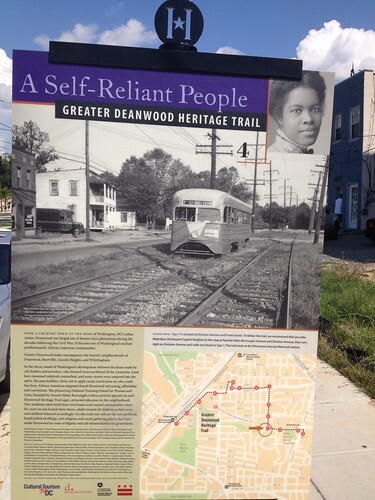 Part of the Marvin Gaye Park Trail overlaps with the Greater Deanwood Heritage Trail. And here you can see that the trail runs along - if not on top of - an old streetcar line (and the old WB&A railroad ran right through the same area). I noticed that this building along the Met Branch Trail between V and W was recently razed. Does anyone know what's going in it's place? There's going to be a ribbon cutting for the Nannie Helen Burroughs Avenue Great Streets Project today at 1pm. DDOT doesn't have any new photos of it on Flickr, and I haven't been out there, but the project includes bike lanes and improvements to the Marvin Gaye Park Trail. Tonight, July 24, 2012 from 6:30-8:30pm GWMP will host an Open House informational meeting at Washington-Lee High School on the Arlington County and Vicinity Non-Motorized Boathouse Facility EIS process. A short group presentation will begin at 7:00pm, the remainder of the time be in an "Open House" format with staff available at presentation boards. This meeting is being held so that interested people can learn more about the EIS process, have an opportunity to view preliminary alternatives and submit written comments about these alternatives. All are welcome to attend. There will alsol be a pre-construction meeting to discuss upcoming construction work and construction hours for the Charles Barrett Safe Routes to School project on Tonight at 7pm at Charles Barrett Library located at 1115 Martha Custis Drive in Alexandria. The proposal includes "adding bicycle "sharrow" markings to mark on-road bikeways". There was an attempted robbery/assault on the Georgetown Branch Trail earlier this month. "Two male suspects assaulted the victim and unsuccessfully attempted to remove property from the victim. " Capital Bikeshare won one of Tommy Wells' liveable, walkable awards. And from December 9 through 20, holiday treats exclusively for Capital Bikeshare members are being offered in Georgetown courtesy of the Georgetown BID. And also, CaBi has discounted memberships again. The WABA holiday party is next week. Also, WABA teaches kids to bike safely - as part of a Safe Routes to Schools funded program. Tree blocks the Marvin Gaye Park Trail. This was one of many weather-related barriers reported yesterday. The Holiday Shopping Fun Ride to DC Markets is this Saturday. Looking at this map of national traffic fatalities again, I realized that as bad as it looks, it doesn't even include all the fatalities that actually happened - not for cyclists at least. Missing, for example, are Ian Wolfe and Yoram Kaufman. That having been said, if you can name any of the cycling victims in the immediate DC area - especially prior to 2005, please note that in the comments, I try to keep track of these things for the blog. Bicycle facilities in the I-66 corridor. Indian Head and White Plains are arguing over where to put a caboose to be placed along the Indian Head Rail Trail. There's also debate over whether to make it a museum or small shop. Along a trail in Montreal, there was a small bike repair shop in a caboose along the trail. I day go with the shop. Park Service's preferred plan for the Blue Ridge Parkway is the least bicycle-friendly one (of three bad choices). In my opinion, this is a bicycle. I wonder how the law would categorize them - sometimes having a small wheel means it isn't a bike, so that kids can be exempt from "no biking on the sidewalk" laws. Also, this is not a bicycle. Good morning. FYI Women's World Cup semifinals today featuring USA vs. France. A rematch of the Quasi-War. Remember the Retaliation! The Virginia Department of Transportation has named John Bolocek as the long awaited Statewide Bicycle and Pedestrian Planner. He officially begins July 11. The Oregon Avenue EA comment period has been extended to July 29. At a recent meeting on this, one speaker in favor of option 4 (bike lanes) was booed. Much of the complaining appears to be about sidewalks - with one person calling them ugly. [That's just rude. Sidewalks are very sensitive, and they haven't grown into their height yet. In college, they are really going to blossom, and you'll wish you'd been nicer to them.] But widening the road for bike lanes isn't popular either. If you want to go to a meeting and insult street elements [Tree boxes are lazy!] You can go to the public scoping for Broad Branch Road Environmental Assessment. This is the road with the damaged bridge that was replaced with a one lane bridge, where cyclists were then discouraged by being banned, but now they aren't banned anymore. "The project involves the rehabilitation of Broad Branch Road between Linnean Avenue and Beach Drive, NW. The proposed improvements are to address current infrastructure deficiencies as well as community and safety concerns." If you'd like to see more consideration for cyclists in this corridor, you can show up tonight from 6:30-8:30pm at Chevy Chase Community Center. DDOT has signed off on the Walmart site at New York Avenue and Bladensburg Road. But not after insisting on '"a complete overhaul of all streetscape facilities" including sidewalks, crosswalks, pedestrian signals, and bike lanes around the site.' and moving the Capital Bikeshare station from the north end to the center for better access. 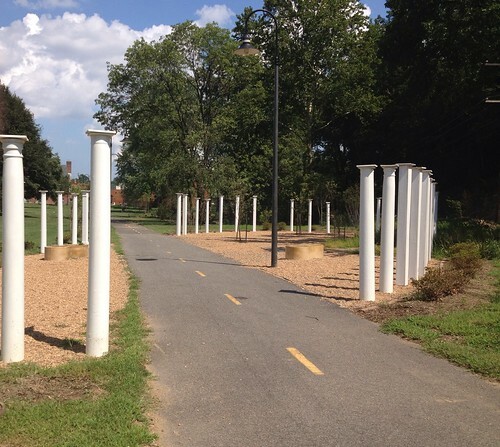 The Marvin Gaye Park Trail will not run right through the middle of Peanut Park (pictured). "the bike path that cuts through the park is lined with white, reclaimed wooden porch columns, which highlights the community’s front porch culture." More coverage of WABA's proposed legislation against aggressive driver behavior directed toward cyclists. AAA's John Townsend is interviewed, but plays it safe. From the Post "a woman on a bicycle was seriously injured about 4:30 p.m. in a collision on Georgia Avenue that involved three cars. The woman was taken to a hospital after the incident near Otis Street NW." A letter to the editor on trail safety, written by a cyclist. One jurist on Roger Clemens' perjury jury is an avid cyclist. Patch blogger who "hates" cyclists says she was kidding. She never revs her engine to scare cyclists. But she isn't sorry about what she wrote.